While people around the world honored refugees on Monday for World Refugee Day, we also watched as violence in Sudan mounted, where hundreds of thousands are now displaced. As the dramatic rise in violence of recent weeks has made clear, the fight for peace in the region will not be over after South Sudan is granted independence on July 9. 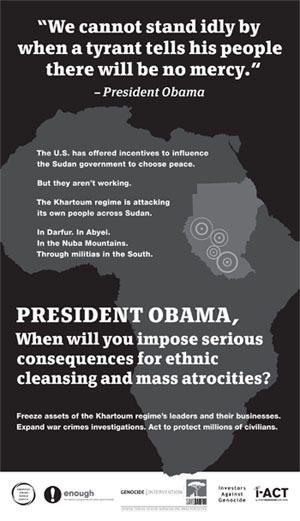 We must all push for peace in both Sudans now. There are steps we can take here in the United States to help. Please join Enough and our partners today for a national call-in to President Obama. There are just a few hours left. Please ask your friends and family to make this important call as well.